Early work mornings can only be salvaged so much by a bright cup of coffee, right? 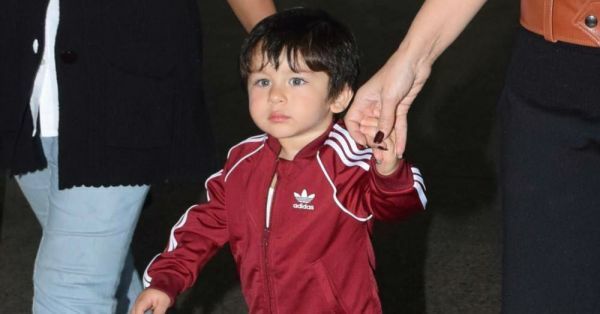 Once in a while, though, social media can shake you out of your drowsy slump with a hilarious meme or if you're lucky - a baby doing super adult things... like wearing a super luxe Adidas Originals sports suit. 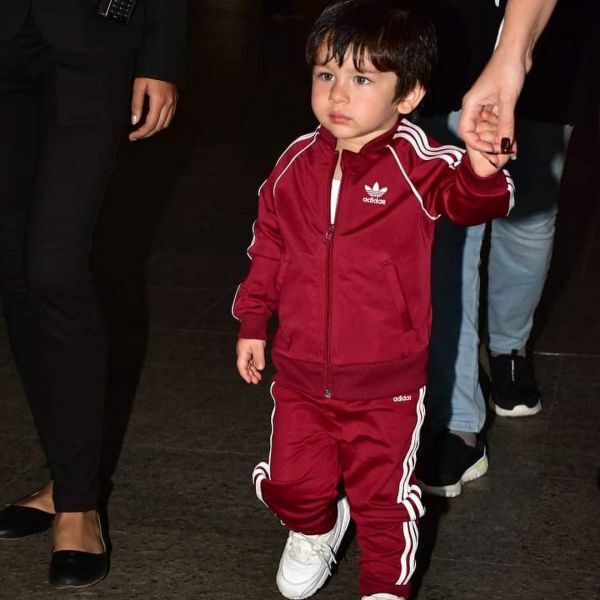 The two-year-old son of Kareena Kapoor and Saif Ali Khan looked like the celebrity he is in a shiny burgundy tracksuit and trust us, it was EVERYTHING. The tiny sports suit consisted of a burgundy zip-up high collar jacket with striped side panels and the Adidas Originals logo, along with marching joggers. Taimur wore a white vest under the co-ord set and also a pair of classic white trainers to finish. 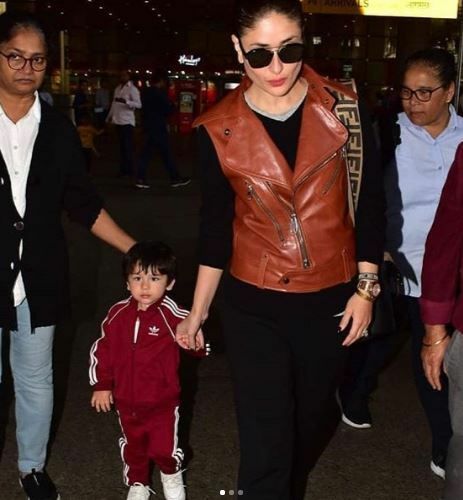 Trust every member of the Kapoor clan to nail their airport looks every single time, eh? While our junior Nawab rocked a casual comfy look, his yummy mummy chose a more sophisticated outfit to travel in. Kareena Kapoor Khan wore a black tee and pants, layered with a vest-style tan biker jacket and also, a Fendi shoulder-strap satchel bag. We don't know about you but for us, Taimur stole the show. The way this boy has been impressing us with his outfits, we can see him climb to the top of the best-dressed list by the time he's a teenager. In fact, he reminds us of our current fave, Ranveer Singh! Doesn't he? 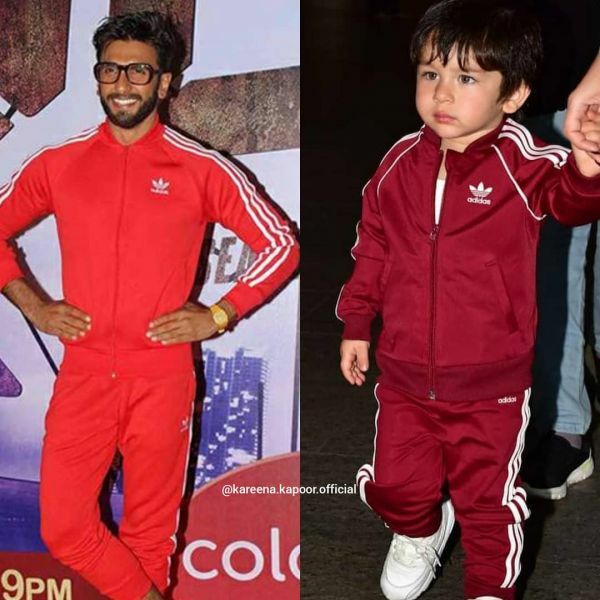 On that note, here's to Taimur's bright and fashionable future. AWESOME NEWS! POPxo SHOP is now Open! Get 25% off on all the super fun mugs, phone covers, cushions, laptop sleeves, and more! Use coupon code POPXOFIRST. Online shopping for women never looked better.